With the name “heat pump” the confusing thing can be how these devices offer cooling and not just heating. Plus, they don’t pump heat at all – they transfer it. So how do heat pumps offer your home both heating and cooling? It’s pretty simple and depends on a couple of key items, but first, it’s important to know how a heat pump works. As mentioned above, heat pumps work by transferring heat from one location to another; refrigerant helps facilitate this transfer process. During the summer months, a heat pump absorbs the heat in your home and transfers it outside; in the winter months, the heat pump absorbs the heat in the surrounding air, concentrates it, then distributes it to your living spaces. Heat pumps don’t generate heating or cooling, which is where they can be a little confusing to some. So why can heat pumps do this and air conditioners can’t? A component called a reversing valve. The reversing valve is a component that changes the direction in which the refrigerant in the system is flowing. When the refrigerant can change direction, the device can change between heating and cooling. The initiation of the mode change starts with pressing a button on your dual-mode thermostat. An electronic component attached to the reversing valve known as a solenoid begins the process of moving the sliding mechanism in the solenoid to the opposite side; once the slide starts moving, refrigerant flows into the valve, finishing the rest of the push to the other position. The positioning of heating or cooling within the valve is up to the manufacturer, so valves will differ. The important thing is that the valve slides from one position to another, otherwise it can get stuck. One of the more common problems that can develop with a reversing valve is that it becomes stuck; the valve can become stuck in a mode or stuck in-between a mode. If the solenoid is the reason for the immobility, it can be repaired, but if the valve is stuck due to something like a refrigerant leak, it will need to be replaced. Your heating is too important to be handled by someone inexperienced, so if you are having an issue with your heat pump, call A–Professional Heating and Air Conditioning today and schedule service for your heat pump service in Hammond with one of our heating experts. Posted in Heating | Comments Off on How Does a Heat Pump Heat? How Practical Are Heat Pumps for Heating in Metairie? For the warm summers and mild winters of Metairie, LA, a heat pump offers a number of attractive features. Heat pumps combine the power of an air conditioner and heater in one unit, which makes them automatically beneficial as two-in-one systems. However, heat pumps are not always the best choice for a particular region (unless installed as a hybrid with a back-up heater), and even in regions where they are practical, they aren’t always the best choice for an individual home. We’ll take a more detailed look at heat pump operation to see how practical they are for Metairie, LA heating and if your home specifically will benefit from their advantages. For more information, as well as to schedule an appointment to discuss heat pump installation, contact A–Professional Heating and Air Conditioning today. A heat pump uses the same operating principle as an air conditioner: refrigerant circulates through the unit, going through a cycle of evaporation and condensation to move heat from one location and puts it in another. The heat pump adds the ability to switch the direction the refrigerant flows, using a reversing valve. 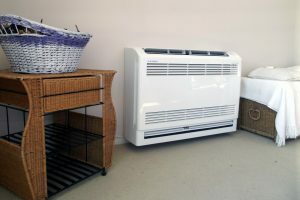 This means that the heat pump can both remove heat from the indoors and put it outdoors (air conditioning) and remove heat from the outdoors and put it indoors (heating). If you’re immediate thought is, “How does a heat pump extract heat from the cold outdoors to warm up a home during the winter?”, then you’ve latched onto one of the potential drawbacks of a heat pump. In general, a heat pump works less effectively in heating mode than in cooling mode. However, heat pumps only experience difficulties with efficiency when the outdoor temperature drops below freezing. Otherwise, there is a sufficient amount of heat even in cool weather to provide enough warmth for the indoors. In a place like Metairie, which rarely experiences extreme cold, the warmth from a heat pump is enough to keep most homes warm. Heat pumps will save you money on heating compared to a furnace. Heat pumps only use a small amount of electricity to run their mechanical components to move heat from outdoors to indoors. Furnaces, on the other hand, must expend a large amount of fuel to create heat. Switching from a furnace to a heat pump in an area without extreme colds can result in savings of up to 30% off heating bills each year. You will need to have heat pump installers to help you answer this question. The insulation of your home, its size, access to power, and other factors will determine how efficiently a heat pump will work for your cooling and heating in Metairie, LA. Call up A–Professional Heating and Air Conditioning to get started: we’ll help you decide if you’ll benefit from a heat pump, and provide you a quality installation. Posted in Heating | Comments Off on How Practical Are Heat Pumps for Heating in Metairie?